No idle hands here! They’ve been busier than ever this month with knitting Christmas presents. I completed the pom pom baby blanket for my niece that I shared with you before. It used up 5 balls of yarn. And although it wasn’t perfect, each stitch was made with love. 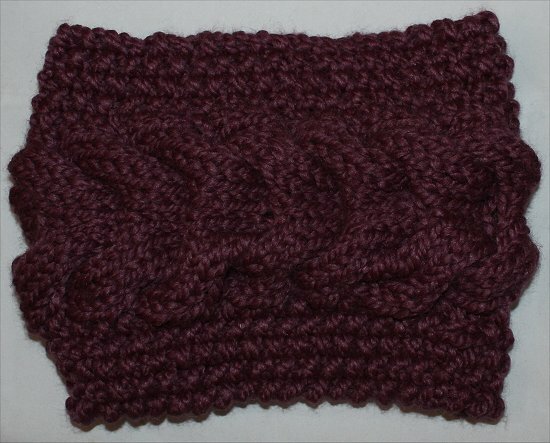 In addition to knitting a dark-cranberry cable cowl for my mom, I also made one in a dusty rose for my sister-in-law. The purple cowl I showed you before on here is the same style. I ended up keeping the purple one for myself because it was more of an ‘experiment’. The following two cowls were super-quick to complete. I literally finished knitting 2 cowls in about 5 hours. It’s a fun and easy pattern that I recommend you try. 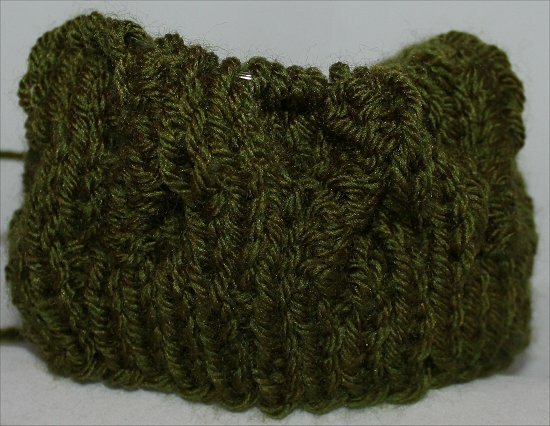 So, now that Christmas is over, I’m back to knitting another hat. 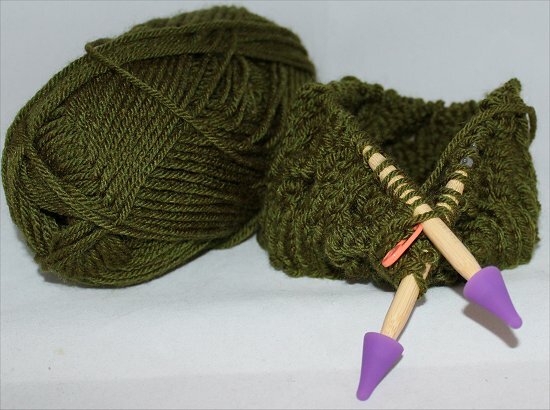 It’s no secret that green is my favourite colour, so now I’m Knitting a Green Beanie. Here’s a closer look at it so far. This shows the brim and a little more of the hat. You can see the beginning of the swirling design. Hmm…and I don’t think I ever showed you the completed purple cowl. This is what it looks like when lying flat. It’s so cozy and warm. I like tucking in the bottom and keeping the upper brim up. But I’ve also worn it with the top and bottom tucked in. It looks better when worn than just lying flat. Happy Sunday to all of you! Can you believe that it’s almost the end of the year already? 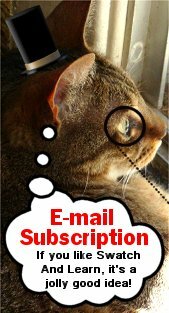 This entry was posted in Knitting, Smorgasbord Sundays on December 30, 2012 by Mary S.. I LOVE your knitting posts just as much as I love your nail polish posts ! Such an awesome colour to knit a beanie in !! I’ve never attempted a beanie, but think I should, looks so pretty ! If you have any favourite knitting blogs, please let me know. I love looking at other people’s projects. I don’t know if there are any mitten patterns, but it’s a great place to start. They put out the Knitter’s and Crocher’s magazines. My best suggestion would be to go to the library and look at some books. I was in your country last weekend and was able to make 2 hats myself! Thank you for the informative resources. I’ll be sure to check it out! Wow, nicely done with the two hats! Jealous! I can crochet all day, but knitting has always eluded me. I really want to take up crocheting! 🙂 It looks like you can put together things faster, and I like how you can more easily create round projects. Mary, I love your knitting posts! I’m just starting to learn now since there’s a knitting club at work, and I’m having trouble just casting on. Lots of youtube tutorial videos in my future, haha. I love the colour of green you picked for the beanie! WOW, that must be a lot of fun! Hehe, at my workplace, we talk about knitting, and after seeing my hat, one co-worker made 2 of them as well using the pattern. I even bought her all the same material I used! 🙂 It’s fun being able to share these projects with others and knit along together. I have a friend who does crochet, I have some headbands she made for me!! 🙂 this is one of the things I want to learn, but in 2014..! maria emma recently posted: Es todo acerca de rojo y dorado.. y brillar..
That’s soooo nice of her to crochet headbands for you! What do they look like, and what colour are they? Hehe, how come you want to wait until next year to learn how to crochet? Why not start this year? 🙂 Knitting is soooo much fun, and I’m sure that people feel the same way about crocheting! I have just started knitting but I hope to work on kintting projects like this one soon. 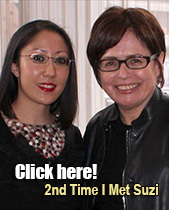 I hope that you enjoy it – it’s such a relaxing process, too!